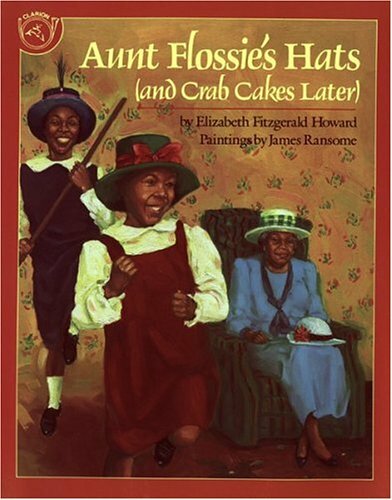 Two young, African American sisters love to visit their great-great-aunt Flossie and her hundreds of hats. Each hat holds a vivid Baltimore memory—the 1904 fire, the parade at the end of World War I—and the girls are fascinated as Aunt Flossie tells the stories. Aunt Flossie’s hair is just starting to gray. She looks staid as we see her pouring tea, walking in the park with her family and telling stories in her chair, but she doesn’t mind the chaos involved in letting her great-great-nieces open all those hatboxes and parade around the house. Bold brushstrokes and vivid colors bring the characters and remembered action scenes to life. Aunt Flossie is based on a real person who lived to be nearly 101. The 10th-anniversary edition of the book includes the author’s fascinating afterword with black-and-white family photos, imparting a real sense of African American history.